Once you arrive at the Castle on the morning of your wedding, you will have exclusive access to the King’s Suite. With 3 rooms, you’ll have plenty of space to dress, prepare and enjoy time with your bridesmaids. 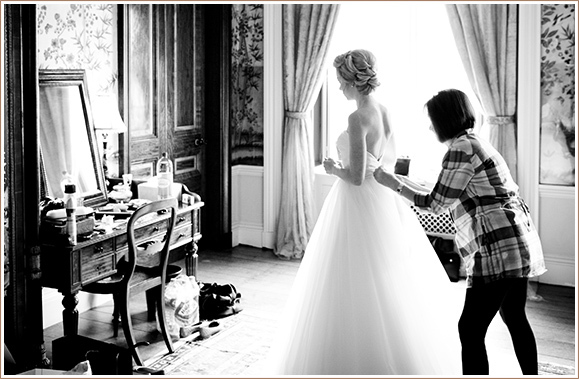 The most beautiful three rooms are available for your bridal party to get ready. The Kings Rooms were once used to home the Royals when they visited so you will feel truly magical! The Groom is not forgotten with his own Gentleman’s Shooting Room for the groomsmen to get ready too. To end your perfect day, the Castle bedrooms can be hired for brides, grooms, family and friends. Belvoir Castle has 14 bedrooms available for your wedding party with a minimum occupancy of 5 bedrooms per booking. For more information and other accommodation options visit our Stay With Us page. Fantastic! Made me feel like a princess! We all had such a fantastic day, the castle is a total dream, the sort of thing you see in films. The wedding co-ordinator is totally amazing with lots of experience and ideas. The whole team, throughout the planning and the actual day, were second to none. The food, drink and the service amazed my guests. My wedding party also stayed overnight which made the weekend even more special. The staff made it feel like home. An absolute must see venue! The castle is stunning, with its beautiful rose gardens and grounds. Wish I could do it all again! To hear more about how we make your day a success, please contact our Wedding team weddings@belvoircastle.com or call 01476 871 001.